A vaporetto ride from Venice takes you to Burano, a small island in the Venetian lagoon with a lacemaking past. Vaporetto Lines 12 and 14 from Venice's Fondamenta Nuove take you to Burano - as well as to Murano (glass blowing) and Torcello. 40 minutes by ferry from Venice, Burano's colorful houses offer the visitor a respite from the faded gray of most Venetian Pallazzi. The houses, it is said, were painted these brilliant colors out of the fishermens' desire to see their own houses from far out at sea (or to find them when they'd had a bit too much to drink). Most tourists come to see the colorful houses and the famed lace-making of Burano Island--and to buy lace. Alas, much of the lace you see is mass produced in Asia and the whole idea of producing fine lace is falling out of favor with young women still living on Burano. Still, you might catch a glimpse of someone making lace in front of her home. It's important to check out the provenience of the lace you buy. Be aware that truly handmade lace is labor intensive and very expensive. Try La Perla, a lace shop on on Via Galuppi 376, the main street, where women are often seen working inside so you can see how it’s done. You can also visit the Burano Lacemaking Museum (Museo del Merletto di Burano) located at Piazza Galuppi, 187. It's open from 10am to 5 pm every day in Summer. Cost at the time of writing is €5. Colorful houses are everywhere. Take a walk down the canal-lined streets, check out the leaning campanile of San Martino, have lunch at the historic Trattoria da Romano or a similar restaurant that preferably doesn't have people pestering you in bad English to check out the atrociously translated menus, and take some pictures. 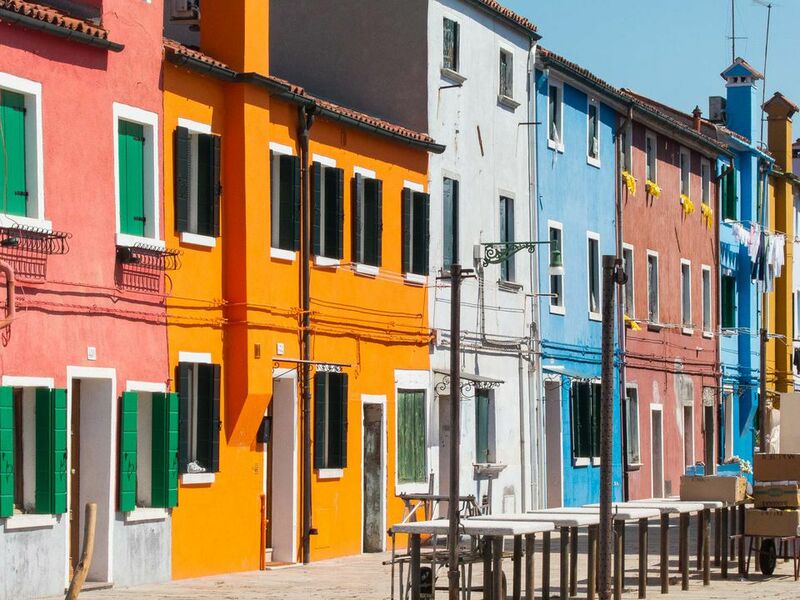 Better yet, follow our itinerary for a day trip out of Venice that starts with the colorful island and goes beyond Burano: A Splash of Color in the Venetian Lagoon. Viator offers quite a few tours of Venice's outlying islands, see Viator Burano Tours to get prices and information. For those visitors on a very limited budget, we advise you to stay in somewhat cheaper Padua, a 25 minute train trip away from Venice. This isn't ideal, so try to stay in the big city and make trips to the outlying islands from Venice. See our Burano Picture Gallery.